ACM have been committed to helping customers for more than 30 years. We are your local supplier (Nordics) of products and Services in the wire and cable industry. ACMMT (MT stands for Measuring Technology) manufactures and supplies the well-known measurement products KSM & DSM worldwide. KSM is an"off-line" cable measuring unit that measures cable slices, tubes and profiles. Want to reduce cost in the cable industry? Read more "Reducing insulation consumption"
Read more "Control the Resistance and reduce cost"
DSM is used for very quick measuring of diameters and ovality in drawing dies and extruder tooling. Esteves is proud to introduce to you the eWizard™ handbook which presents an overview of dies and their use in the wire and cable industry. We hope you will find this handbook useful in the course of your business activities. 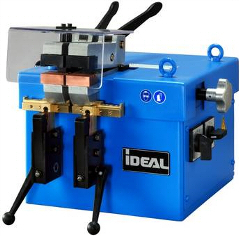 The latest addition to a long history of innovation is the new type MSM 86 rod breakdown machine designed for wires made of copper, copper alloys, aluminum, aluminum alloys, and other non-ferrous metals. State-of-the-art technological features and modular design result in dependably high quality wire surfaces and high production output. The real innovative power comes from unprecedented energy efficiency and an energy consumption which is 10% lower than of its predecessor model MSM 85 and 20% lower than of conventional rod breakdown machines. ACM has chosen Leng Tools as new supplier of Tungsten Carbide drawing dies. ACM is now IWE representative in the Nordics. High quality steel reels for the cable and wire industry. PLASTICOLOR has choosen ACM as its new partner in the Nordics. ACM is the new agent for AstroPlast in the Nordics. ACM will now be able to deliver the best plastic spools on the market to its customers. ACM is now working with Cimteq to help cable customers in the Nordics. Have a look at there Cable Design software application, CableBuilder. It is a feature-rich software application that helps you to design, quote, and produce cables of all types in both 2D and 3D more efficiently and cost effectively than ever before. With the move of the administrative departments to the new office building on the new site the factory building project has been completed. All Niehoff facilities in Schwabach are now accomodated in the new plant. NIEHOFF Magazine 02_2015. Read interesting news from the wire and cable industry. See the latest market developments and trends in automotive wiring and automotive wire production. NIEHOFF Magazine 01_2015 keeps you informed of important NIEHOFF news and developments, trade shows and events and other interesting topics.Just take a look – we hope that you enjoy reading this issue! We are now working with the marking and printing company RSD Technik, which is a company located in the southern part of Germany.